No, a forklift cannot become sick, however it can break down. And when a forklift breaks down it can have the same adverse consequences as losing a key employee to a cold or flu. Lost time in the workplace oftentimes means there will also be a financial loss. So, it’s important that you keep your forklifts and other machines in excellent physical condition. Your fleet of forklifts should be routinely maintained. You should have the machines in your warehouse scheduled to have maintenance at intervals appropriate for usage. You should also conduct daily inspections on your fleet of forklifts. One terrific tool for forklift operators is a checklist. An operator can physically check off the required daily duties. 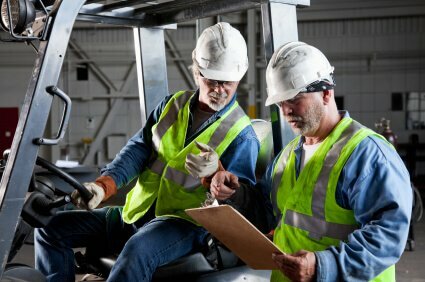 A pre-shift checklist also allows an operator to notice any signs of potential wear and tear. Finding a small problem with the machine before it becomes a big problem is vitally important to ensure that the machine is kept in proper working order. When it comes to warehouse employees you can’t merely provide them with a daily checklist for their health, but you can help them to understand the benefits of vaccination and other similar methods to protect themselves from illness. Nothing can cripple a warehouse like the flu. Make sure to provide employees with proper sanitation methods. Keep the soap stocked in the bathroom. Hand sanitizers are also a terrific idea to keeping the spread of potential germs to a minimum. And the most important part of keeping employees safe and healthy during flu season is to send sick employees home. One sick employee can spread sickness to everyone; and while the loss of one employee during a particularly busy workday can be difficult, the loss of an entire workforce due to illness would be devastating. With the flu season soon approaching, remember to keep both the machines and employees healthy and safe. And if you ever need any forklift maintenance, or would like to add to the forklift fleet in your warehouse, then call Anderson Forklift today.